Cook rotini to desired doneness as directed on package. Drain; cover to keep warm. Meanwhile, heat oil in 12-inch nonstick skillet over medium-high heat until hot. Add onion and garlic; cook and stir 1 to 2 minutes or just until garlic begins to brown. Add sweet potato and bell pepper; cook and stir 2 minutes. Add water; cover and cook 2 to 3 minutes or until vegetables are tender. 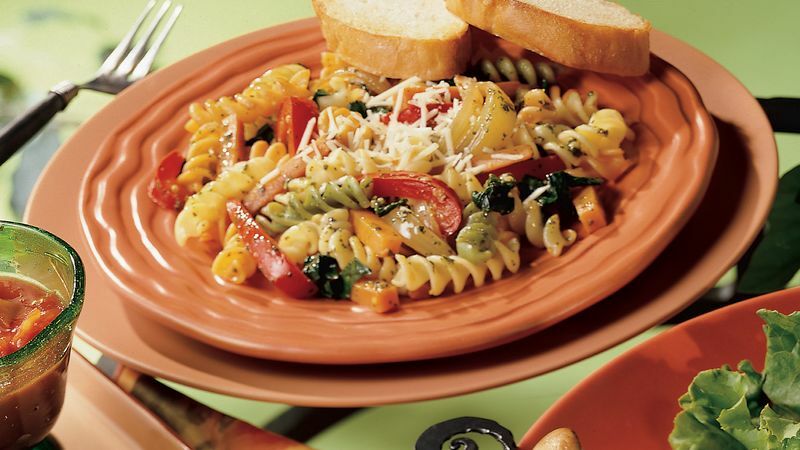 Add cooked rotini and spinach; stir gently to mix. Cook uncovered until thoroughly heated. Remove from heat; stir in pesto until well mixed. If desired, add salt and pepper to taste. Sprinkle with cheese. For the best color and sweetest flavor, select sweet potatoes with dark skins. Use 1 3/4 cups of carrot strips in place of the sweet potato. The spinach, sweet potatoes and red bell peppers combine to make this recipe an excellent source of vitamins A and C.